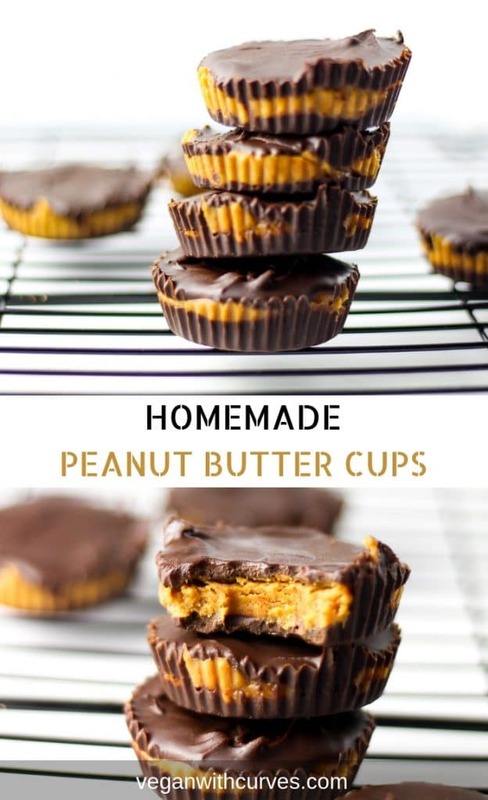 Have you ever wondered how to make Homemade Peanut Butter Cups? Well, now you can put your curiosity to rest. 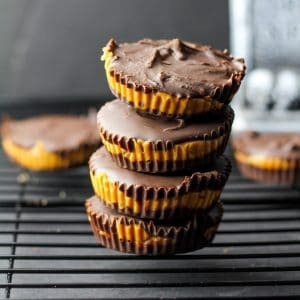 Homemade Peanut Butter Cups are super easy and fun to make! 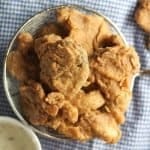 And yes these are vegan! 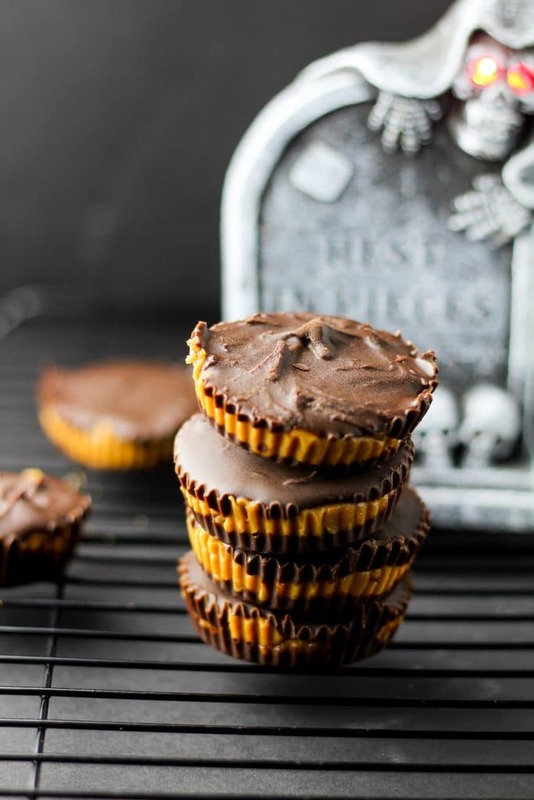 A perfect fun treat for Halloween or when you have a sweet tooth! 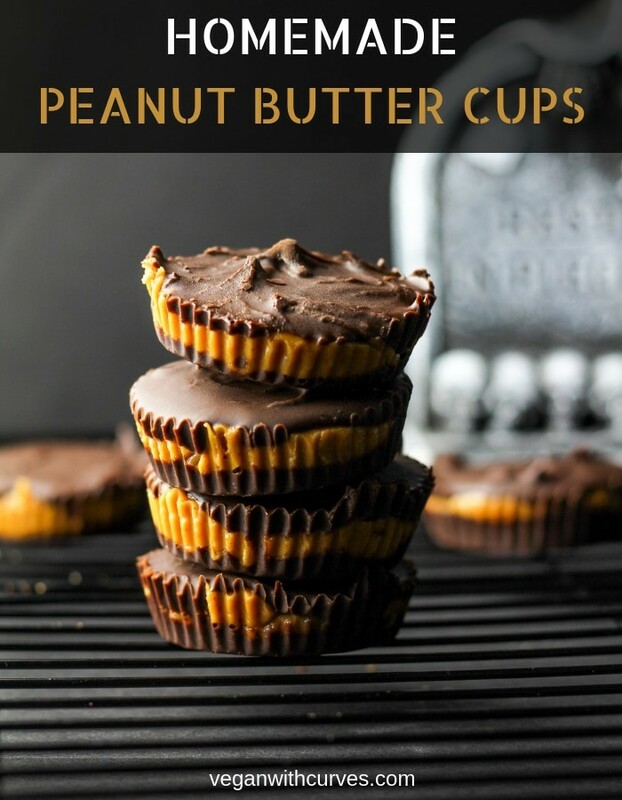 I had so much fun making these homemade peanut butter cups! They turned out so good I ate the entire batch in 2 days! (I don’t recommend anyone follow in my footsteps lol) If you never had homemade peanut butter cups before you are in for a treat! You won’t miss the pre-packaged version at all. Cruelty-Free Chocolate! Yes, there is such thing as vegan chocolate chips! In fact, pure chocolate is vegan by nature so really calling it “vegan chocolate” is redundant. But for purpose of clarification, always look for chocolate chips that state there was no milk used. I LOVE this brand HERE. 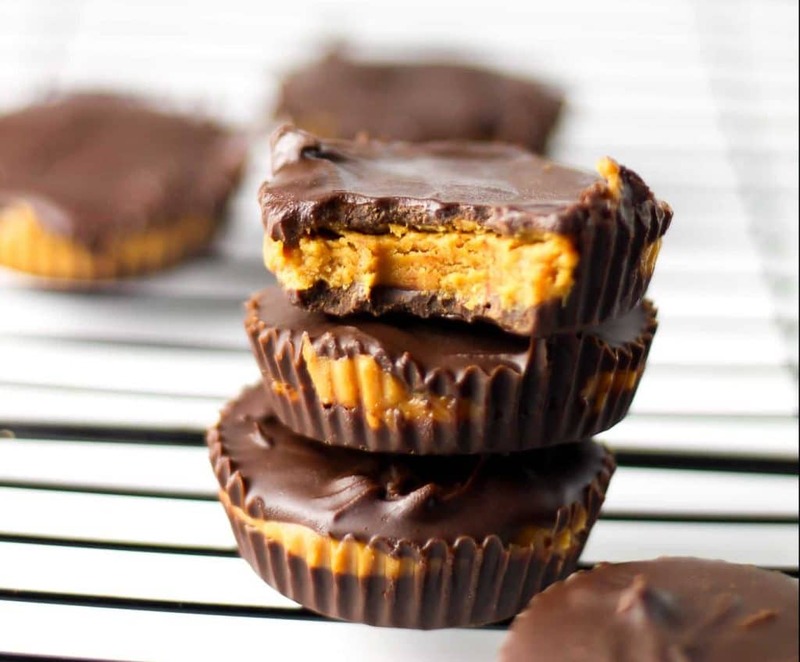 “Not Sweet Like Honey.” These homemade peanut butter cups did not become sweeten with refined sugar or Honey (both of which are not vegan) but with coconut nectar. 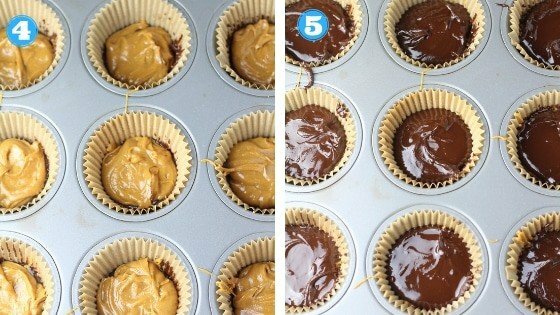 Coconut nectar has such a unique sweetness and brings a lovely flavor to these homemade peanut butter cups. Easy and Messy. So easy to make but also a tad bit messy with melting chocolate. But that is a good thing! 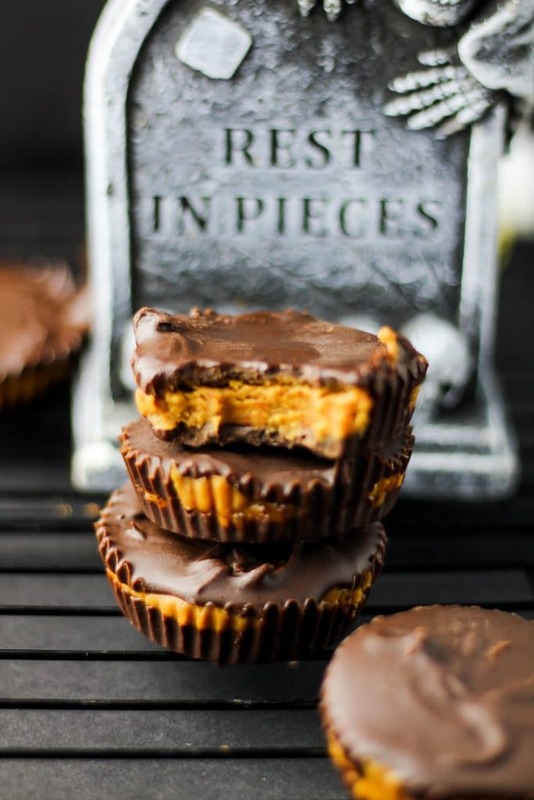 I felt like a child again and you will too when making these peanut butter cups! First, grab your double broiler (or a heatproof glass dish and a pot) and melt your chocolate. 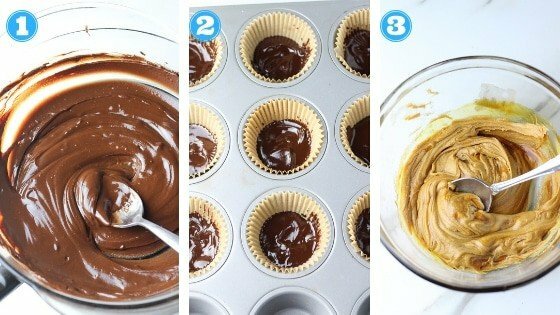 Pour half of your chocolate in cupcake liners. Then mix your peanut butter and coconut nectar together and pour that on top of your chocolate mixture. Lastly, with the remainder of your chocolate top it over your peanut butter mixture. 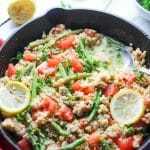 Pop in the freezer to set and enjoy later once done! 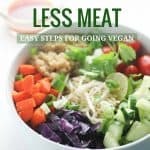 Peanut butter is the Vegan With Curves star of this dish! I always joke that I live and die by peanut butter on my vegan curve building journey. Technically it’s not a joke. 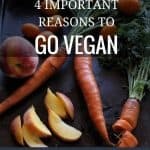 Peanut butter is a Vegan With Curves building powerhouse with approximately 200 calories per 2 tablespoons. 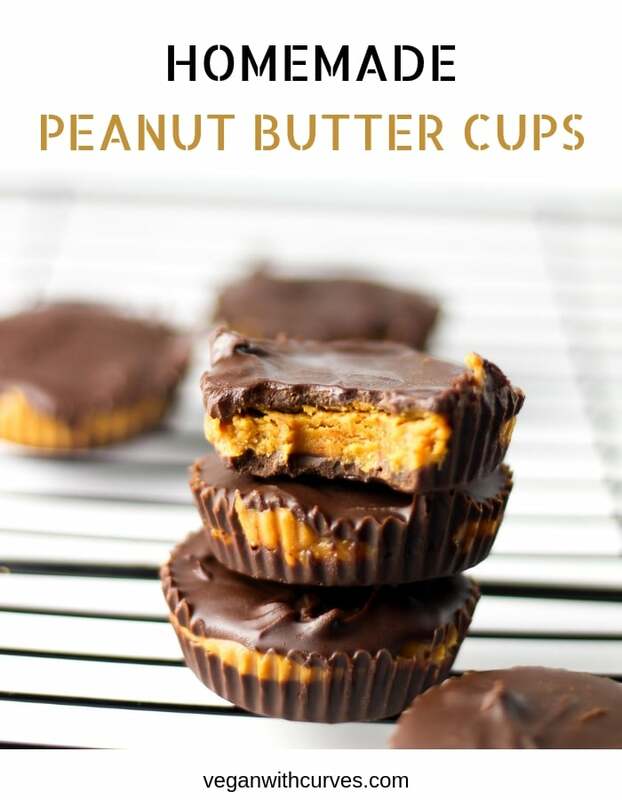 I hope you have fun making these Homemade Peanut Butter Cups as much fun as I did in making them, photographing them, and yes even eating them! Trick or Treat, Happy Halloween, and Enjoy! Line a muffin tin with 9 muffin liners. Set aside. Grab a double boiler or a heatproof glass bowl and place over a pot of boiling water. Add vegan chocolate chips, coconut oil, and vanilla extract and stir until completely melted. Set aside. In another medium bowl, stir all peanut butter and coconut nectar together until smooth. Be sure to use natural peanut butter as it still contains the oil making it easier to stir. 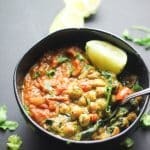 If you don't have natural peanut butter on hand, add a little bit of coconut oil or heat up in the microwave for 10 - 15 seconds just enough to get it liquid enough to stir. Set aside. Start assembling your first chocolate layer. Scoop chocolate layer into each muffin cup filling up all 9 cups. Next add the peanut butter layer, using all the peanut butter topping over the chocolate layer. Lastly, add the remaining chocolate on top of the peanut butter. 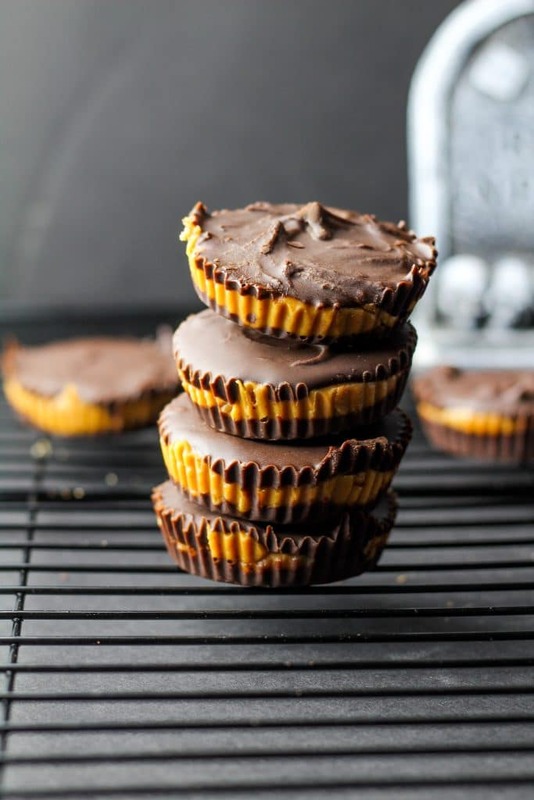 Place homemade peanut butter cups in the freezer for 30 minutes or until firm. 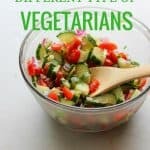 They store great in both the freezer and fridge. Enjoy! 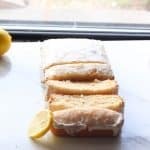 This will work great with almond or cashew butter! Use your favorite liquid sweetener if you cannot access coconut nectar.